I’ve served salmon with lentils probably dozens of times since Mike and I have been sharing meals, and while it’s a great combination, last night I decided to change it up a bit. Since we were away last weekend and weren’t able to do our usual food safari, I had to stock up on a few provisions earlier in the week. 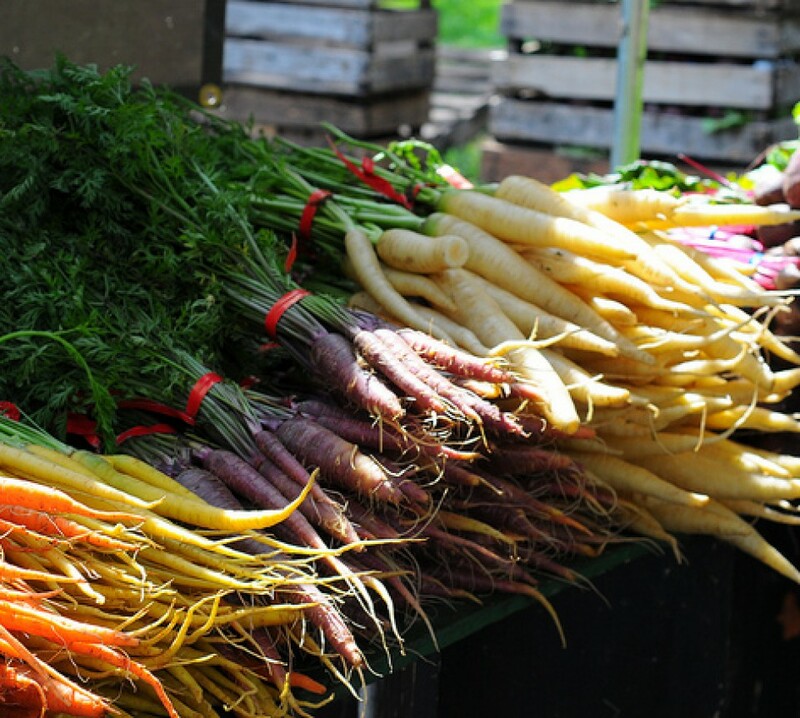 I went a little crazy at Greenwich Produce, bringing home fingerling potatoes, Meyer lemons, little stem cherry tomatoes (I know, I know, but they were so pretty and jewel-like I couldn’t resist), red and golden beets, and a gorgeous bunch of rainbow chard. 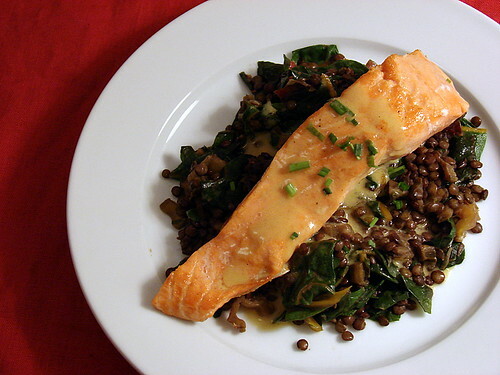 Since chard and lentils play so well together in soup, I thought I’d combine them to go alongside our salmon fillets. I started by separating the chard stems from the leaves, trimming the bottoms and slicing the stems thinly. I sautéed them in a bit of olive oil along with a couple of smashed garlic cloves and a pinch of kosher salt until they were tender, and then added a cup of Puy lentils. I poured two cups of water into the pot, added a generous amount of fresh thyme, covered it and let it simmer over low heat. While the lentils were cooking, I rolled up the chard leaves like little cigars, sliced them into about 1 inch ribbons and gave them a good rinse, letting them drain but leaving a little water clinging to their leaves. When the lentils were tender and had absorbed almost all of the liquid in the pot, I added the chard leaves, gently stirring them through until they were just wilted. I dribbled in a little sherry vinegar, gave it another stir, and spooned the mixture onto our plates, topping them with our salmon and a quick little pan sauce of sharp Dijon mustard, white wine, and lemon juice with a knob of cold butter whisked in at the end. The salmon was great but I really loved the chard and lentil combo. It was quick and wholesome and would actually make a great meal on its own, topped with a little feta or goat cheese (or one of my favorite poached eggs). I liked it so well, in fact, that I’ve packed the leftovers for my lunch today. As Terry B can attest, sometimes the side dish really is the star of the show. i’m really into chard lately; i just made a vegetarian taco with poblano and butternut squash from one of rick bayless’s books the other night. this looks like a super-tasty (and good for you!) and pretty easy weeknight dinner. yum! How did you cook the salmon? Great blog. I’m putting up a link on my blog (www.lifechef.blogspot.com). You’re a great inspiration to get over that “What’s for dinner?” conundrum! Delicious. I have to try the lentils chard combination. I especially like the sauce for the salmon. I have been topping mine with a white wine, dill cream sauce. Yours sounds like a welcomed alternative. Oh, wow, Jennifer. This looks really good. I’m a big fan of swiss chard. I can’t wait for spring when the farmer’s market here has the most spectacular new baby swiss chard. And it goes so well with lentils. The whole dish looks like a nutritional powerhouse. Jennifer–Wow. I never think of cooking the stems on chard; I always just toss it. Very cool. Oh, and thanks for the nice mention! Also very cool. Michelle – oh, that sounds great! I have made a version of some of his chard tacos as well and they’re an awesome meatless dish. Gail – I usually do salmon and other skin-on fish fillets in a super hot cast iron skillet, seasoned just with salt and pepper, a little bit of oil in the pan, cooking them most of the way on the skin side then flipping them to get a little color on the flesh side. Donald – dill and salmon are a classic – yum! theitaliandish – Thank you! I’m really looking forward to spring and all of its tender young greens myself. Terry B – You are quite welcome, and thank you for the inspiration! As a renewed lover of salmon (I had a period where I couldn’t stand salmon), this looks really tasty! I made this tonight and it was ridiculously awesome. Thank you so much. Hey, todd – you’re welcome!